I finished another book in the Paranormal 13 set. This one is about a woman who can see ghosts. As a general review, it was another book with a female lead character that got all lovey-dovey. The story was moderately interesting, and the "adventure" of defeating a minor demon was brought to a conclusion. The overarching character-development storyline seems to have an obvious solution that was not completed in the book, but the answer seems so obvious that it doesn't seem worth reading any more of the series for that story. I suppose the hints I picked up may be wrong, but still doesn't seem worth it. So, by the ruler of simply, "Did the book have a concise adventure that was completed, indicating that future books would have a chance of being concise adventures that could be read individually in no particular order", the series is fine. But, the story itself wasn't interesting enough to me, and there was too much "girl stuff" in it to be enjoyable to me. I hate putting my phone in my pocket. I've got too much crap in there already, and it makes it too hard to get to. So when I got an otterbox case, I also made sure to get a belt clip for it. But one of the mounting ears broke off of the clip. Instead of trying JB Weld or superglue, I decided to try and make a new one out of metal. Read more if you care about the steps, with pictures. I've been welding on the gate for the rental property. I've used 1 inch, 11 gauge square tubing. The gate frame is 18 feet long, by 6 feet tall. I'll mount a wheel to it on one end, and weld up hinges in an uphill configuration on the other end. Pictures are below. I ground out the welds on the sides to help the boards sit flat when the pickets are mounted. I remembered after the first couple that the pickets won't actually touch the frame; only the 2x3 cross boards will. But I ground out the rest of the welds just to be consistent. 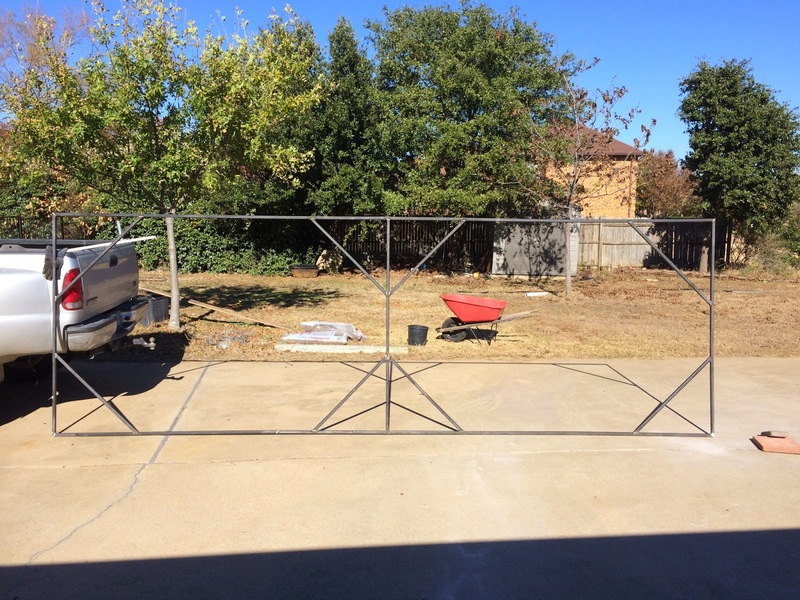 Anyway, I stood it up and put a 4x4 under each end, then had my wife stand in the middle. It didn't bow much, definitely not enough to touch the ground, so we'll see how it does with all of the wooden pickets attached to it. We bought the metal at the Fort Worth www.discountsteel.com retail store. I had them cut the 12 foot pieces in half so that I wouldn't have 10 feet of tubing sticking out of the back. Then I cut one piece in half to give me two 6 foot pieces to weld to 2 of the remaining 12 foot pieces. I don't have any way to mount them straight, so I laid them on the floor of my garage clamped to a 4 foot level on the side, then welded across the top. Before I flipped it to the next side, I ground that weld flat so it wouldn't interfere with the level. It worked out pretty well on the first piece. But I took too long on one side of the second one, and it bowed up. I might have been able to use another level and clamp across the bottom as well, but I don't know that I could have supported it well enough to keep it from bowing. Oh, well. It doesn't look too bad, and I don't need to be that picky. Continuing my review of the Paranormal 13, I just finished the 9th book, Nolanders, Emanations Book 1. It has an interesting creation myth, and an unresolved storyline to justify the series-ness. However, the primary character ends up as part of a secret organization, so it's possible that the the future books could have a spy-series type feel, with the series storyline laid over that. I couldn't say for sure without actually reading the second book, but this first book did seem to have a concise adventure that was basically concluded. Of course, it could also be that I finished the book (and did most of the reading of it) late at night, and that I just WANT one of these series to actually be enjoyable. I'll let you know more if I get around to buying the second one. Because I'm watching a TV show called "Chuck" right now, it is a good example of what I want in a series. There is an overarching story line of a rogue agent stealing intelligence data and sending it to an old friend. They slowly build why he stole it, why he sent it to that particular person, etc. But each episode is also an individual spy adventure. That's the kind of series I want to read. But if the entire series was just the primary storyline, without the side-quest adventures, it would be pretty boring. I used SketchUp to design some up-hill gate hinges for the rental property, and to work out the intial amount of metal I need to buy for the frame. My SketchUp File is here, if anyone wants to see it, and details are below. Continuing my review of free ebooks in regards to whether they are stand-alone adventures, and therefore part of a series worth buying, we start with the fourth book from the "Paranormal 13" set. My last post was a rant on the whole "trilogy" and overall "series" mentality of modern authors. Now, I'm going to start reviewing the recent ebooks I've been reading, almost exclusively from the perspective of whether I view them as stand-alone adventures or not. So, read below if you care. I've started some lazy-man's hard cider. Just 100% pure apple juice from the store, with a bit of instant yeast thrown in, and a balloon as an airlock. I don't drink, so I won't even be able to tell if it's any good or not, and will have to rely on my wife and friends. But if it comes up even reasonable, then I may look into juicing my own apples and trying a more authentic batch. It only takes a couple of months to age, so it may be one of the simpler alcoholic brews I can make. I have another bottle I'm going to mess with later, but I'm just going for sparkling apple juice. I don't even remember what my point was with that at the moment. Since I already know I can carbonate a beverage from my ginger ale experiments, it's probably not worth the bother without fresh pressed juice, but it will be a quick and cheap experiment, I suppose. The only thing I really stand to learn is probably how the yeast affects the color, clarity, and flavor of the store-bought juice. When I was younger, you could pick up a book by any author and read a complete story. What happened to that? The Hardy Boys, Sherlock Holmes, Pip and Flinx, they all were stories in a continuous universe, with characters that could grow as you read more books. But they were each stand-alone stories instead of weekly soap operas. Now it's hard to find any book that doesn't seem to be written from the get-go with the sole purpose of hooking you into buying the next book. I checked the bees again last week just to make sure I could find the queen. I was confident she was there because the brood I saw last time didn't seem to be drone, but I wanted to make sure. I did find her, but she was not marked. This could be simply that the paint as worn off, or it could be that she was killed and replaced toward the end of summer during the period that I didn't get a chance to check. If that's the case, it may explain the low hive population. (Long-winded explanation at the bottom.) I also got under the hive this week while it was cold and looked up through the screened bottom board to see how big the cluster was. It is probably only 2 to 3 frames wide. Even figuring that it did seem to go from front to back, that's nowhere near the basketball or soccer ball size that the internet says it should be. But, maybe Texas doesn't need that large a cluster, and the small hive I'm seeing is normal. At least they are going through syrup well, when its warm, so maybe they won't starve. I did find that I killed 10 or 15 bees when I rearranged the combs. One of the honey combs was extra wide, and I didn't realize it when I put it on the outside edge. When I then had to shove everything over to get the last frame back in, bees were trapped between the wall and that comb.